If you are missing one tooth or a few teeth, the gap between teeth can be problematic for a variety of reasons. Not only are the remaining teeth more likely to shift out of place, this movement could alter your bite. Now you not only have the problem of missing teeth, you have pain as well. Dr. Chi Fu of Chester Hill Dentistry will help you determine if a dental bridge is a right way to fill the gap. There are many solutions for missing teeth. Dental implants, in particular, are growing in popularity. But for patients seeking a less-invasive solution that is just as permanent, a dental bridge gets the job done effectively. The components of a traditional fixed dental bridge include the false tooth – also known as a pontic – and porcelain crowns. 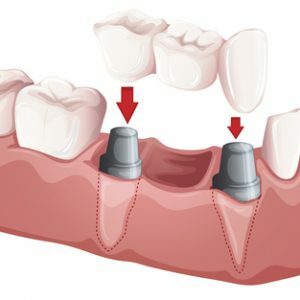 The crowns (abutments) are attached to the teeth on either side of the area where the tooth is missing and serve as anchors for the false tooth which is fused between the crowns. The false tooth is usually made of porcelain fused to metal (PFM) or ceramics. This is the most common type of dental bridge, but it does involve the permanent removal of tooth enamel so the crowns can be secured in place. The cantilever bridge is a bridge that is supported on just one side by an abutment. The cantilever bridge works the same way as a fixed dental bridge, and even if there is only one natural tooth next to the space where a tooth once was, a bridge can be bonded in place. The cantilever bridge is used less often as a replacement for missing teeth because there can be complications – in some cases, the restoration behaves like a lever because it is not secure on one side. This can lead to loosened crowns or fractured teeth. If you are missing a tooth in an area of the mouth that undergoes less stress, like the front teeth, a resin-bonded bridge may be used to eliminate the gap where a tooth once was. Metal bands or clasps are bonded to the surrounding teeth with resin and are used to hold a plastic false tooth in place. Many patients prefer to avoid a resin-bonded bridge because it is not as aesthetically pleasing as the other bridge options. How Is a Dental Bridge Applied? Dental bridges take at least two visits to your Westchester dentist to complete. The first visit involves the preparation of the area and surrounding teeth. Teeth will be filed down so the anchor crowns can be fitted in place. An impression of your teeth will also be taken so the pontic and crowns can be created at the dental lab and customized precisely for your restoration. At this first visit, a temporary bridge will be put in place to protect your prepped teeth and to leave you with a pleasant-looking smile while you wait for your permanent bridge. The second visit involves the removal of the temporary bridge and the fitting and adjusting of the new fixed bridge. It may be necessary to schedule follow-up visits to check the fit of your new bridge. When the bridge is properly in place, it will look natural and feel comfortable so that you can go about your days without worrying about the solidity of your smile or the function of your teeth. Above all, most Rye dental patients want a dental bridge to eliminate the unsightly hole in their smile. Even if you’re missing a back molar that is rarely seen, the absence of that tooth can make you feel self-conscious about your appearance. It can also be difficult to bite or chew when you’re missing a tooth. What you may not realize is that just one missing tooth can lead to a barrage of oral health complications. How well your mouth functions depend on the presence of all your adult teeth. Even the shape of your face can be altered by a missing tooth. Two of the biggest problems are that the teeth on either side of your missing tooth now have the freedom to move about. They may try to fill in the gap in your smile. In other words – teeth rely on each other to stay put, and filling that space with a bridge prevents misalignment and unwanted movement from occurring. Dental bridges are low-maintenance restorative dentistry solutions. The restoration can last for decades if you take good care of your teeth and see your Westchester dentist regularly for check-ups and teeth cleanings. Simply brush and floss as normal to ward against tooth decay and gum disease. Dental bridges are an excellent, convenient, and long-lasting smile solution. By scheduling a consultation at Chester Hill Dentistry, you will learn about all the restorations that are appropriate for your missing teeth and that work best for your lifestyle and budget. Contact our office to schedule an appointment with Dr. Chi Fu. We proudly serve the residents of Rye, Westchester, Rye Brook, Port Chester, and surrounding areas, including Greenwich, CT.